Back in December 2008, when the App Store was still less than half a year old, I wrote a post about an application that has now become something of an iPhone staple: iFart. 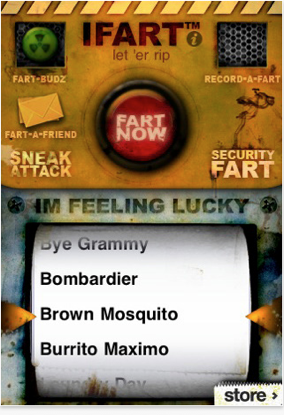 The app and similar ‘gross’ applications like it have gone on to become immensely popular, proving that the general public has an insatiable and somewhat disturbing appetite for recorded flatulence. Unfortunately (at least for fart-lovers), the application has hit a snag on its way to the iPad: iFart HD has been rejected on the grounds that it has “minimal user functionality”. This, despite the fact that the app will literally shake your iPad when it emits a ‘bombardier’ or ‘brown mosquito’ (the iPad’s speakers vibrate a lot). iFart isn’t the first application to be hit by this arbitrary rule — we’ve previously written about apps like QuackPhone, which made your iPhone sound like a duck, and was rejected on similar grounds. But iFart isn’t some unknown application. In fact, it sold 100,000 copies in its first 14 days (reaching #1 on the App Store), once ranked in the top twenty iPhone applications of all time, and has over 20,000 reviews to date. Joel Comm, CEO of iFart’s developer InfoMedia, says that it took a month of waiting before he got ahold of an Apple representative, who told Comm that he’d have to add quite a lot of functionality to the application to have it approved for the iPad — sound boards, even well-known ones, don’t cut it. Comm has been through this before. When the App Store first launched Apple was routinely blocking applications like iFart and Pull My Finger, until it finally opened the floodgates to these ‘joke’ applications in December 2008. This time though, the application isn’t being blocked on the grounds of profanity or crudeness. Rather, it’s a lack of functionality, which is harder to change. The only consolation is that Comm can add a landscape mode to the existing iPhone app, but it wouldn’t be a native HD version. Comm points out the inconsistency of the App Store review process, noting that similarly themed apps like Farting Zombies have made it onto the iPad. Of course, such inconsistencies on the App Store are nothing new, but that doesn’t make them any less frustrating for developers. Comm also points out that InfoMedia isn’t just developing so-called ‘crapps’: its application GameDock was among the first multiplayer gaming platforms on the iPhone, and iVote has gained popularity as a polling app. If nothing else, this makes it clear that Apple is looking to keep the bar higher for the iPad than it did for the iPhone. There’s no way to know if Apple intends to eventually lower it, but my hunch is that Apple wants the iPad to be viewed as a full-fledged computing platform rather than a device with big-screen joke apps. Comm shares a similar sentiment — he thinks that Apple is afraid that approving fart apps would lead to an influx of ‘novelty’ applications for the iPad. So it may be awhile, if ever, before you get to experience iFart HD in its full glory (or lack thereof).